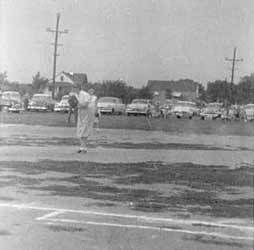 Here is an incredible "action" photo of a baseball game being played across from Main Street School! 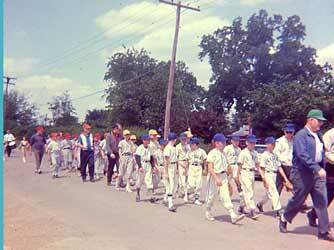 Baseball was a pretty big deal in Lisle... Just look at how many people are watching the game! Shots like these make doing this web-site so worth it! Thank you Mike Buchman (Now living in New London, WI) for sending in this picture along with some of the below "black & white" shots. Mike says these were from his mom's collection and they had "1949" written on the back. Here is a game being played behind the old VFW hall. Yes, now we have two pictures of the VFW. the VFW. 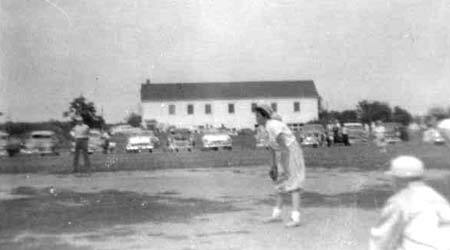 This photo shows Mike Buchman's Mom playing shortstop. I'm not sure where this is being played... I'm sure it's behind the VFW but I just can't tell. If you know.. Please let us know.This photograph is probably looking towards Main St. This looks Like the field behind the old VFW. 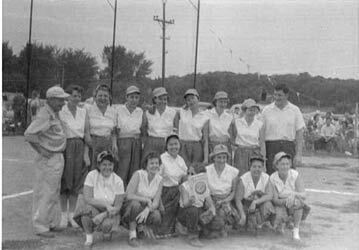 This is a photograph of the Lions club women's team. Here come our proud men of steel! They are in a parade coming down the Main Street hill (south) marching past intersection of Middleton & north Main going towards town. I'm pretty sure this picture is from the early 60's. Before the full blown uniforms. This photo is from the mid 60's and taken at the exact same spot the other was taken. (Notice the telephone pole.) Remember how the Park District teams were just colors? And we still thought we were soooo cool! The "red team!" The "Gold team!" YEE HAAA! 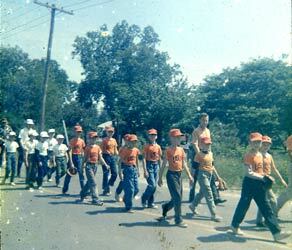 The baseball players uniforms were: Farm League orange...Intermediate League, Royal Blue. Funny... I can still remember the smell of my mitt. Oh, by the way... The property directly to the right of the telephone pole in the center of the photo was called "Rocky Hollow," the mini-farm where the Kruml (spelling?) family lived for years - it's all gone now. I'm not too sure why I threw this shot in other than the fact that you can see the old Main Street School ball field backstop. That's the old post office on the left and if you look close enough, you can also see Norman Oil "Service Station" at the end of the road and across Ogden. This shot was taken around the mid to later '70's. We welcome your comments, stories or pictures!